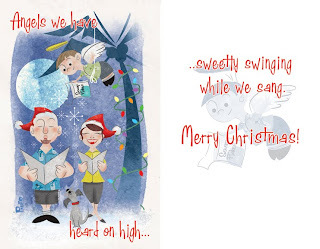 Here is the card that I created for my family this year. Hope people get them since the illustrious FedEx and the USPS have handled the express shipping with the speed of syrup rolling uphill! I hope everyone who reads this has a safe and wonderful holiday. 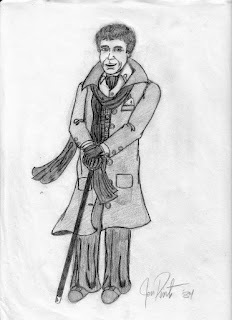 Back in the day I did all my pencil drawings and took them to the fullest. Or at least the fullest I could with my meager abilities. I really labored over this drawing. It was done on cold press illustration board at something like 16 x 20! I spent FOREVER working on this. Pulling reference from magazines because I had no Internet and I had no Photoshop! Might as well have been a cave painting! I remember being close to finishing this while working at the campus bookstore when a teacher came in and asked to borrow it to show his class. I felt honored! I came across this jpeg while searching for something else in my archievs and thought to share. I wish I had saved this original drawing and not painted over it. If only I had Photoshop a year earlier! 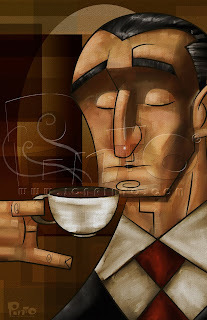 Just another guy with coffee. Odd title, I know. 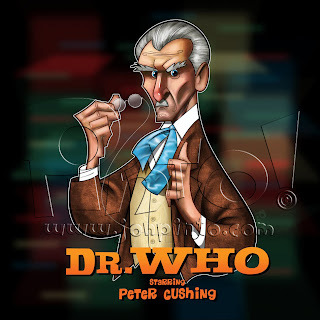 There is a group on Deviant Art that held a contest recently about doing an illustration based on one of the audio adventures of Doctor Who. I thought that sounded like fun and I came up with a sketch pretty quick as I was listening to one in the car during my commute in the afternoons. It was also an opportunity to draw a "modernized, retro Cyberman". Still with me or has my total geekiness turned you away already?? 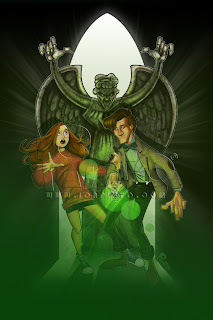 Anyway, it was also an excuse to draw the 8th Doctor and the lovely Sheridan Smith as Lucie Miller. I hope I did them both justice. The sketch was pretty straigtforward and at this point I was not thinking about anywhere else it would be shown except on the website for the contest. 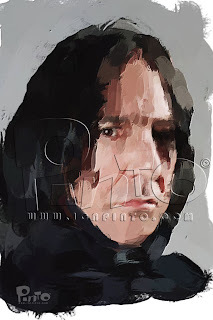 I know it's a day late for Halloween, but I thought Snape would be a cool pic to show on the holiday. Didn't see many Harry Potters out trick or treating last night but I bet that will change next year. 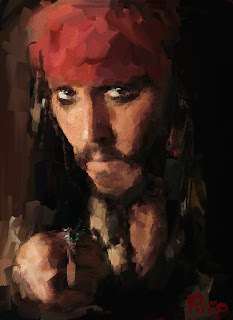 Again, this was painted on my iPhone. Enjoy! So my work will be on permanent display in the UK. Unless they move. 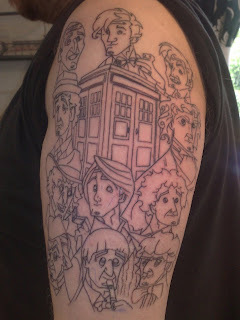 I got an email several months back about having my Doctor Who art made into a tattoo. Lee asked me if I was cool using my art and I was thankful for that. Lee has also been kind enough to send me a picture of the arm in the beginning stage of the tattoo process. 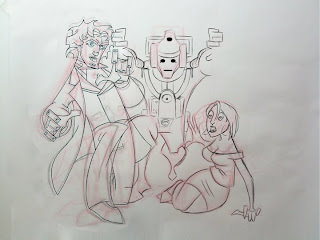 The Tardis in the center is not mine, but you can clearly see the line art for the Doctors all around is clearly my own. I can't wait to see the finished product!! I am honored!! Update: See the finished product here. Found the time to bring this one to a finish. Kinda happy with it. 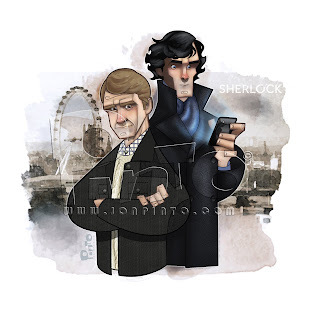 If you saw the show, you may appreciate the fact of Watson engaging the viewer but Sherlock is not. He is too pre-occupied with his snazzy iPhone with an odd image on the case. Hope you like it. Can't wait for this to be out on DVD. Here's the progression too. I kinda got carried away with the drawing stage again. 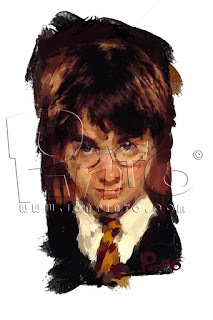 I admit that I am not the biggest Harry Potter fan out there. I do like the movies for the most part and I even read the first book before movies were ever made. My wife Mindy on the other hand is a HUGE fan. This iPhone doodle was done for her. Been pretty busy of late and I really don't have much to post. I did, however, just finish watching the three episodes of the brilliant new British show "Sherlock". Awesome!! Can't wait to pick up the DVD of this one. 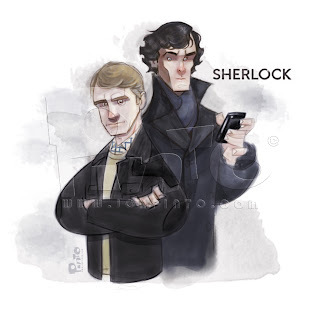 Here is a quick color sketch of Sherlock and Watson from the show. Hope to do finished version in the near future. Enjoy. 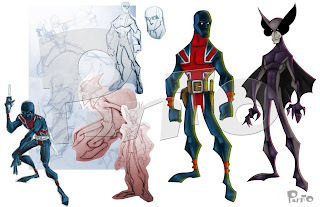 I always thought that the character of Union Jack was pretty cool. A hero from World War One who fought the war as well as vampires!! A second Union Jack continued this during the Second World War and now a current version is still at work! The costumes are so slick and simple and having him British just makes it even cooler in my book. I remember reading one of his earliest adventures in the Invaders comic book and it blew me away. I still have it!!! My first trip to the great San Diego Comi-Con. Have been wanting to go since I was a little kid. Finally got my chance and went with my good friend Mike. You can see him in the photo just behind the Batman mask. Yeah. He always looks like that too. The one and only Bruce Timm! 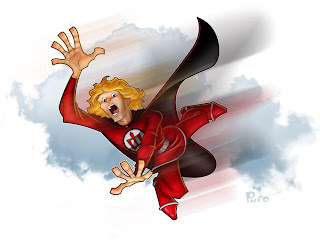 So there was a marathon of The Greatest American Hero on Syfy this past Fourth of July and I totally missed it. I was really bummed not to catch even just an episode or two since I loved that show so much as a kid growing up in New Jersey. With a little luck, I was able to watch a few shows on-line. A bit dated but still a fun watch. And how can you not love a reluctant super hero who lost his instruction book for his suit?? Genius!! I actually started doodling him on my airplane ride to Californina just a few short weeks back. Hard to draw in a bumby airplane and even harder when the old lady next to you is constantly hitting you with her elbow! Once I had my pose the painting went rather quick. In fact, I got carried away with the sketch in Photoshop, that I almost didn't do the "finished" one. I bet some people out there may also think that the colored drawing is better. I don't know. I'm sharing both. Enjoy. I was so inspired by walking around meeting artists, seeing art, etc. at Comi-Con, that I just had to finish this piece. It started out simply enough with some chicken scratch in my sketchbook. I didn't even bother to scan those in. Once I had a clear vision, I did a rough color version on my phone. I really liked it and a cleaner version was made from it in Photoshop. Then I made my final pencil drawing, digitally inked it and painted it. Voila!! Simple as that!! I hope you all like it too. Here, for probably more my amusement than yours, is a view of the progression. No, not my father in law. I already drew him a few years back for something that was actually published. 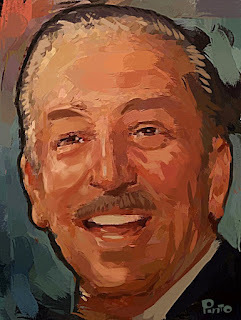 Being pretty inspired by Comi-Con and spending lots of time at Disneyland, I used some sporadic free time to paint Mr. Disney himself. I decided to use just about every paint and photo app I have on my iPhone do get to the finish on this one and I kind of like where it went. I wonder if I remember the process now. Just got back from my trip out west and my first venture to Comi-Con!! Hopefully I will have more on that soon. 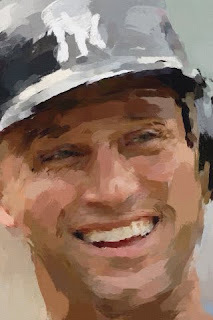 I am trying to get re-adjusted to Eastern Time and my 9-5 but I do have some new stuff to post really soon. 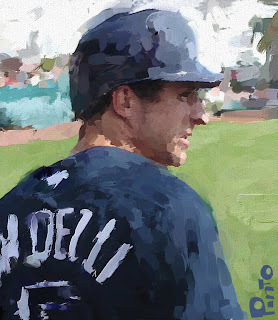 Until then, enjoy another iPhone painting done of Rocco Baldelli!! ...or "Lost Again". Well, not really. That would imply I am posting the same things twice. Which I am not. Don't even know why I just wrote all that. Maybe I am lost after all. Well, two more characters from the show. My favorites, Sawyer and Hugo. 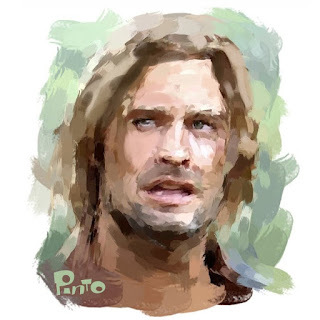 I was an avid watcher of Lost but I gave up quite some time ago trying to guess what was happening. Made my life easier to just watch and "enjoy the ride". I am satisfied with how it ended and feel that for an American show to have a definite ending that is not classified as a mini-series, is awesome. I think more television should be like this. 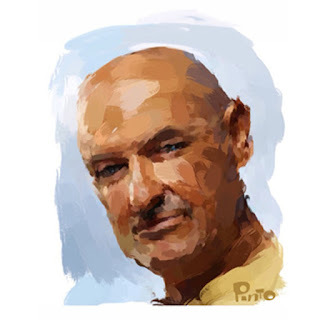 Anyway, here are two characters from Lost painted on my iPhone. Ok, I know that I don't own any artwork done for companies such as Disney, and I also know that popular art sometimes gets "refreshed". 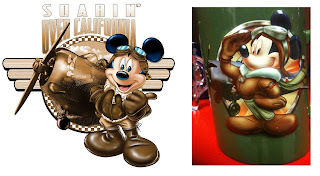 That being said, let me point out a mug I recently came across that looks strikingly like a picture I painted a few years back. Mine is on the left. Look familiar to anyone else besides me??? I guess I should actually be flattered in a way. I usually draw Joseph as a cartoon. 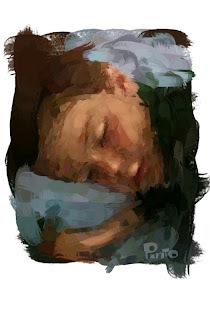 I painted this one on the phone. I didn't hover over him as he slept, that's just when I took the picture. 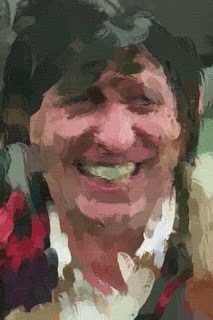 Just to show my friend Jan, and several others, that my Doctor Who obsession is not new and truly a long standing form of dementia. I recently found these in a really old sketchbook and they brought back so many memories. 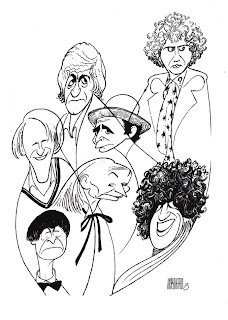 I did these in high school right after I was turned on to the show by John Larkin. 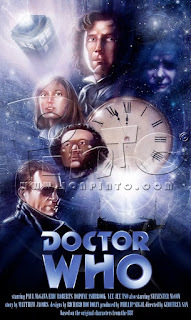 They all feature the Sixth Doctor, Colin Baker as he was set to take over. In fact, one drawing has my own interpretation of his costume since his was not yet revealed here in the U.S. The others have his actual costume but without the patterns since I was WAY too lazy to hand draw those patterns!! 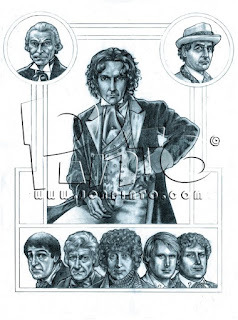 The one with all the doctors faces shows the first time I had drawn any of the older Doctors. I found it fun to compare these with my latest turn at them. Enjoy!